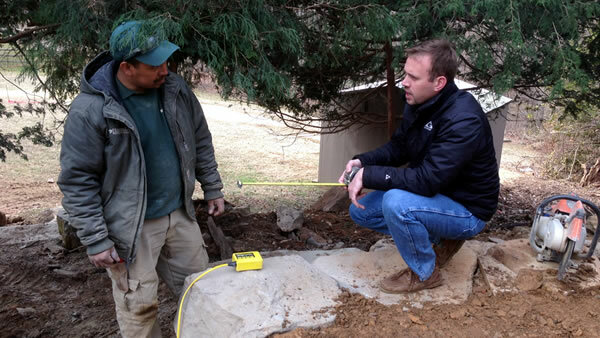 Landscape services How Hidden Lane can help you with landscape design, landscaping installation, landscape care in Northern Virginia Fairfax County. Our designers are well known for their ability to transform your desires into innovative and beautiful landscapes. We pride ourselves in being problem solvers and for helping our clients see the visionary solutions. Upon completion of our projects, many clients tell us “it’s just what I wanted, but never could have imagined on my own.” That’s when we know we were successful. We value our professional relationships and put our client’s best interest first. We look for ways to give the most value for your investment by analyzing how to do each project the most efficient way possible. As a result, the majority of our work comes from existing clients and referrals. Predominantly in Fairfax, Loudoun and Arlington counties, although some of our more comprehensive projects are throughout Virginia. Everything from townhouses to estates, with new projects starting around $10,000. Let’s have a phone conversation to discuss your needs and then we will set a time to meet to visit your property. Your designer will ask you to pull together some information so our first meeting can be more productive. Do you charge a fee to meet with us? No. We want our first visit to be a relaxed, no pressure chance to get to know each other and for us to get a close look at your property. This is a fun and creative process and we want you to be involved from the beginning. We will walk your property with you, discuss design concepts and help you establish a budget for your project. Yes, good designs take time and charging a design fee allows us to invest more creative time on your project. We spend a lot of time in learning about the unique qualities of your property, and this is our time to focus solely on you and your needs. Of course we measure and take inventory of existing plants, but this is also the time for us to start formulating design ideas. The time we spend on your property is invaluable, it’s our time to connect with you and understand how we will connect you with your garden. Your home’s architecture and views from inside your house will also be an important part of our evaluation. Fees start at $1000 and they are applied towards the project installation. When we meet with you to present the plan, we will have a detailed estimate, discuss any revisions and schedule the installation. Your designer is also the project manager and they make sure the installation is seamless with their crew and stress free for you. They are on site at critical times to check concrete forms, set grades, confirm plant layout and tweak and refine the plan. We run a tight ship and keep our projects running smoothly and efficiently to minimize any disruptions for you and the neighbors. Getting Started- please fill out the information on our “Contact Info” page or call 703-620-6155.